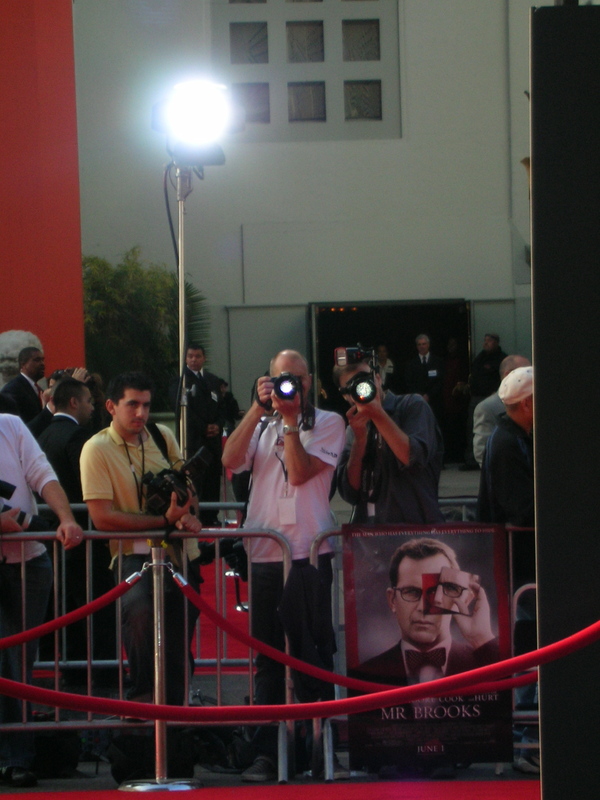 Outside the Chinese Theater on Hollywood Blvd before the MR. BROOKS premiere in 2007. The paparazzi thought I was Minnie Driver. I just ran with it. (Click on the image to see the full screen version. It’s cool). I love this image, including the MR. BROOKS poster, as it relates to perspective and how we view one another. When it comes to the online world, how do we really know who’s on the other end of our broadband? Who are these image and information creators? How do we find them, and how do they find us? Why should we pay attention (or should we)? Can we trust the everyday blogger as a primary news source? What are the implications for offline communities as we rely more heavily on individualized, customized media outlets to communicate with each other? Although we have access to more information than ever before, we can easily hide behind or live vicariously through technology, relinquishing (or substituting) the pleasure and fundamental human importance of face-to-face interactions. One of my goals in this program is to develop innovative online media networks for people to share interests on a local level. How can people represent themselves securely and authentically online, and how can we translate such authenticity into real community building? What are the most effective business practices in creating, managing and growing a meaningful – yet profitable – online community that will facilitate REAL personal communication outside of the technological world? I believe in the power of online media to help forge true connections, and I want to understand how to leverage emerging technologies to effectively maximize them as social tools. Here’s to looking at each other, online world/nation/community!